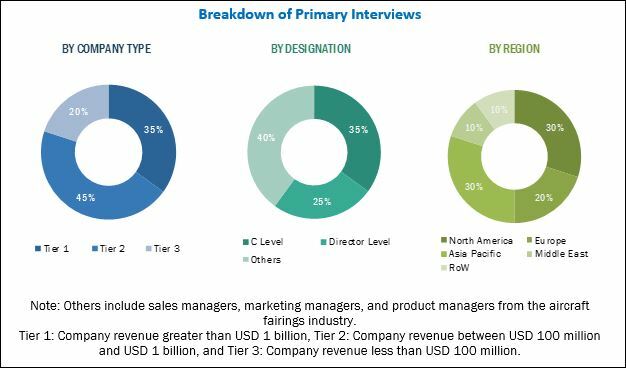 [127 Pages Report] The aircraft fairings market was valued at USD 1.47 billion in 2017 and projected to reach USD 2.13 billion by 2023, at a CAGR of 7.38% during the forecast period. The objectives of this study are to analyze the aircraft fairings market, along with the provision of statistics. It also aims to define, describe, and forecast the aircraft fairings market on the basis of the application, material, platform, end user, and region. The year 2017 has been considered the base year for this study, whereas 2018 to 2023 is considered the forecast period. The aircraft fairings ecosystem providers, such as ShinMaywa (Japan), Strata Manufacturing (UAE), Malibu Aerospace (US), FACC AG (Austria), Daher (France) NORDAM (US), Airbus (France), Boeing (US), Avcorp (Canada), and Barnes Group (US), among others, and the innovators of different types of aircraft fairings, such as Royal Engineered Composites (US), Fiber Dynamics Inc. (US), FDC Composites (Canada), and Kaman Aerosystems (US), among others. FACC AG received a contract worth USD 119 million from Bombardier to produce composite wing-to-body fairings for Bombardier Aerospace’s new CSeries family of regional aircraft. Strata Manufacturing received a contract from the Boeing Company to manufacture vertical fins for flap track fairings for the 787 Dreamliner. Strata Manufacturing partnered with Pilatus Aircraft Ltd. to manufacture Belly Fairings for the PC-24 twin-engine business jet. Strata Manufacturing partnered with Siemens to develop 3D printed technology for aircraft fairing parts to help airlines improve their designs, including manufacturing complex parts. The aircraft fairings market is projected to grow from an estimated USD 1.49 billion in 2018 to USD 2.13 billion by 2023, at a CAGR of 7.38% from 2018 to 2023. The factor that is expected to act as a major driver is the growing use of advanced composite materials in aircraft fairings. This, in turn, is expected to drive the growth of the aircraft fairings market during the forecast period from 2018 to 2023. The aircraft fairings market has been segmented based on application, material, platform, end user, and region. Based on the application, the aircraft fairings market has been segmented into flight control surface, fuselage, wings, nose, landing gear, and other. The fuselage segment is estimated to be the largest in the aircraft fairings market in 2018. The fuselage is the main and central body of a fixed-wing aircraft. It provides space for cargo, controls, accessories, passengers, and other equipment. It includes bulkheads, frames, floor beams, and stringers. In single-engine aircraft, the fuselage houses the power plant, whereas, in multi-engine aircraft, the engines may either be attached to the fuselage, or suspended from the wing structure. Based on the end user, the aircraft fairings market has been segmented into OEM and aftermarket. The aftermarket segment is expected to lead the aircraft fairings market in 2018. Various components of aircraft fairings, such as fuselage, flight control surface, nacelles, wheels, flaps, trailing edge are required to be replaced during maintenance procedures. Maintenance, Repair, and Overhaul (MRO) services are offered by companies as part of aftermarket support services. The aircraft fairings market has been studied for North America, Europe, Asia Pacific, and Rest of the World (RoW). The North America region is estimated to account for largest share of the aircraft fairings market in 2018. 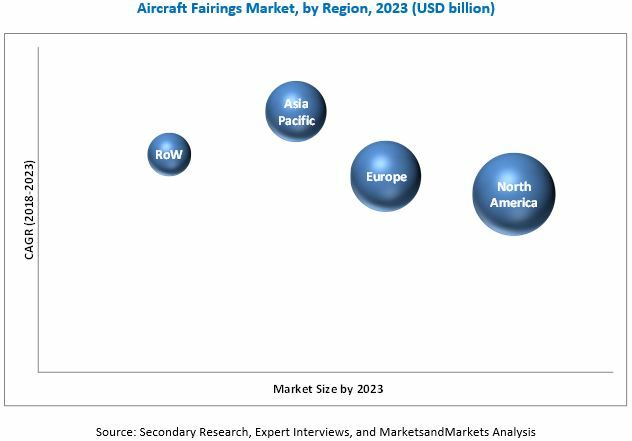 North America is expected to be a leading aircraft fairings market, due to the high demand for newer aircraft and replacement of aging fleets. Whereas, Asia Pacific region is expected to be the fastest-growing region in aircraft fairings market during the forecast period. This is due to the increase in modernization programs in the Asia Pacific aviation industry, which is leading to the high adoption of advanced aircraft fairings. These factors are anticipated to further propel the demand for aircraft fairingss in the APAC region. Some of the global key players operating in the aircraft fairings market in the Asia Pacific region are ShinMaywa (Japan) and Verdant (India). The significant investment required for the development of different types of aircraft fairings is a major factor restraining the growth of the aircraft fairings market across the globe. High investments are required at different stages of the value chain of the aircraft fairings industry (especially in R&D, manufacturing, system integration, and assembly stages). Products offered by various companies operating in the aircraft fairings market have been listed in the report. The recent developments section of the report provides information on the strategies adopted by various companies between November 2011 and October 2018 to strengthen their positions in the aircraft fairings market. Major players in the aircraft fairings market are ShinMaywa (Japan), Strata Manufacturing (UAE), Malibu Aerospace (US), FACC AG (Austria), Daher (France) NORDAM (US), Airbus (France), Boeing (US), Avcorp (Canada), and Barnes Group (US) among others, and the innovators of different types of aircraft fairings, such as Royal Engineered Composites (US), Fibre Dynamics Inc. (US), FDC Composites (Canada), and Kaman Aerosystems (US), among others. These companies have significant geographic reach and distribution channels. Composite materials have become an important component in the construction of aircraft structures. Aircraft parts, such as fairings, spoilers, and flight controls, are made of composite materials for reduced weight. The primary advantages of composite materials include their high strength, relatively low weight, and corrosion resistance. General aviation (GA) has had a long history with composites in flight-control surfaces and some empennage skins, as well as aerodynamic fairings around the wings and stabilizers. These applications represent 6 to 20 percent of an aircraft’s airframe. There has been an increase in air passenger traffic which, in turn, leads to demand for new aircraft deliveries. According to CAPA - Centre for Aviation, the commercial aircraft fleet increased by 4% in 2017 as compared to 2016, globally. The global commercial aircraft fleet in service is expected to grow by 81% to 49,940 aircraft in 2035. The growth of the global commercial aircraft fleet is attributed to the high passenger growth rate of around 5% in the Asia Pacific region. UAVs are increasingly used in various commercial and military applications, such as agriculture, real estate, mining, photography, oil & gas, product delivery, greenhouse emission monitoring, and wildlife research & preservation. The agricultural industry has been the largest end user of UAVs. UAVs have revolutionized the precision farming to offer several applications, such as crop health & irrigation equipment monitoring and weed identification, among others. An aircraft fairing helps improve aircraft performance by eliminating weight penalty. And the usage of composite materials in aircraft fairing helps reduce the cost of aircraft structure manufacturing. The cost of composite materials has been high ever since their introduction over 30 years ago. However, the rapid commercialization of these materials in the aviation industry in recent years has reduced their cost. An increase in the adoption of composites directly affects the cost of components made of composite materials. Technological advancements in the field of aircraft fairing have led to the introduction of digital manufacturing, which is sourcing advanced 3D printers to help manufacture aircraft structural components, such as nacelles, pylons, flight control surfaces, empennages, wings, fuselage parts, and other small spares. 3D printing helps reduce the cycle time of the manufacturing process. Additionally, complex aircraft fairing parts can be easily manufactured using the 3D printing technology. This technology can be used to a great extent by aircraft fairing manufacturers for composite materials.